Monet would be proud. 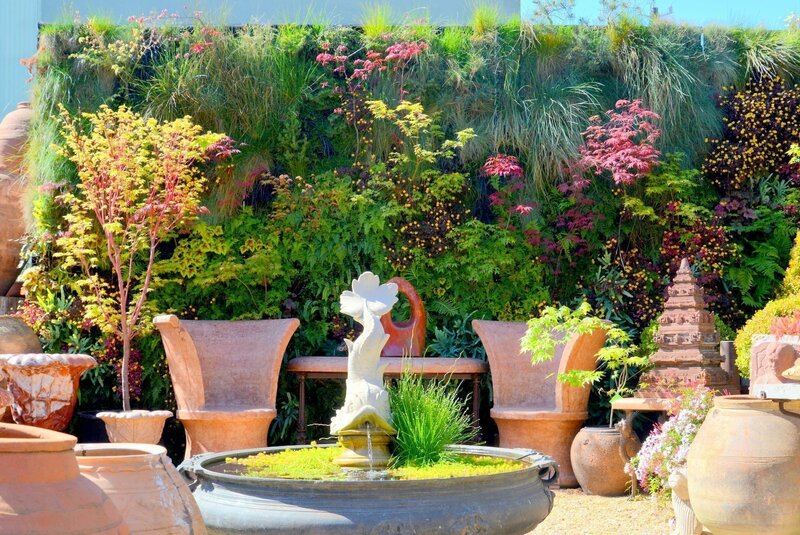 Living Green Design is a noted San Francisco firm that, in their words, “takes a unique approach to garden design that crosses borders, styles and trends.” Their folks believe strongly that interior design, plantscapes and style should all connect to the exterior garden seamlessly. 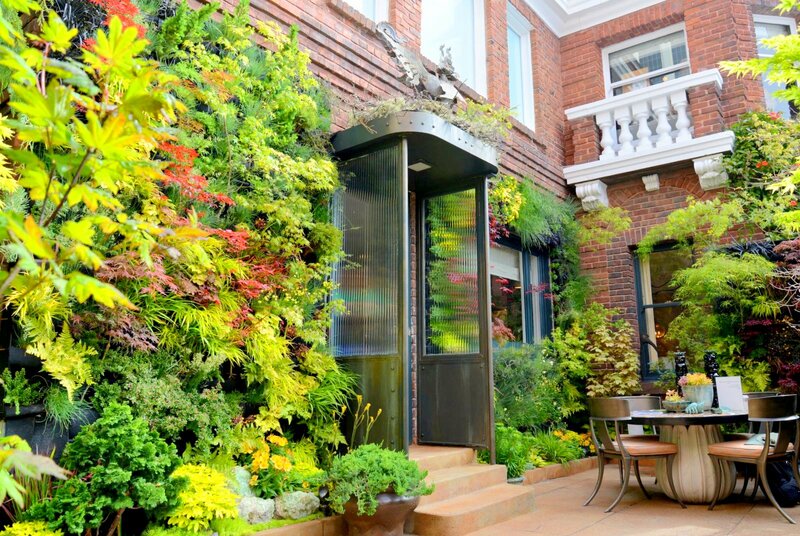 A vertical garden was an ideal way to incorporate this concept of unified indoor and outdoor living. Davis Dalbok, founder and principal designer, and Brandon Pruett, who specializes in creating multi-dimensional vertical living walls, installed a large, 20×10-foot vertical garden at their San Francisco showroom. Davis Dalbok, Brandon Pruett. Living Green Design Showroom. 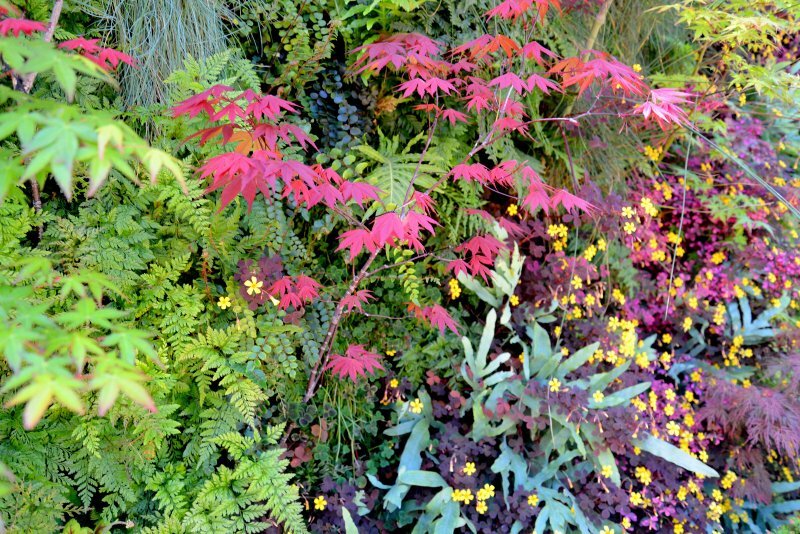 They filled the Florafelt system with a vibrant textural feast of ferns, grasses, yellow oxalis and even trees − Japanese maple! Oxalis is especially versatile when “painting” a vertical garden: besides yellow, the profuse flowers are available in pink, purple and white, and their foliage adds even more color and texture: chartreuse, purple, maroon, silver, purple-black, speckled combos and more. Oxalis also thrives in part shade and likes well-drained, moist soil. Reliable up to zone 5, the plants can be treated as perennials in warmer climes; they’ll need overwintering inside if grown in climates like the Midwest, or they can be treated as annuals. Davis Dalbok, Brandon Pruett, Living Green Design. Decorator Showcase 2013. Plant materials for their showroom were repurposed from the 2013 Decorator Showcase in Pacific Heights San Francisco. Birds of prey was the title of this exhibition that featured grasses and conifers, maples and ferns. All plants which are not typical to vertical gardening but were a total transformation of this enclosed space to a lush landscape of lore. The Living Green team continues to delight and amaze with their unique vision that delivers an experience to be remembered.